Charcuterie is the French art of cooking dedicated to cured or prepared meats such as ham, pâté, terrines, sausages and confit. These items are served all together on a long planche (wooden board) and are to be shared as a group. Truly the most wonderful thing about a charcuterie board is its versatility and so you can never go wrong. It’s an interesting and easy way to serve lots of food without having to cook on the spot, and the perfect thing for impromptu parties. By keeping some of these products in your pantry, you’ll be set for the next time you wish to host, even at the last minute. The word charcuterie comes from the French word chair (meaning flesh) and cuit (meaning cooked) and is pronounced “shar coo tuh ree”. 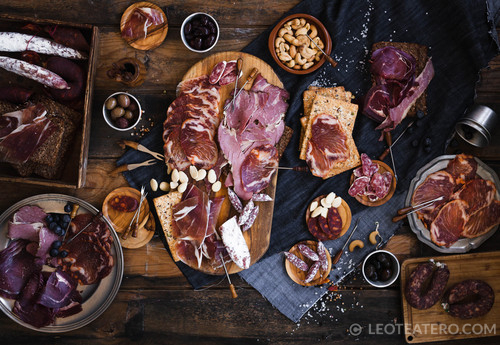 Charcuterie is eaten with your hands and can serve as a starter course for a formal occasion; a platter for apéro (short for aperitif, early evening drinks & snacks in France), or it can be the foundation for a casual gathering anytime. It is also the name of the shop that sells the products too, although they can be also found at traiteurs (caterers) and boucheries (butchers). 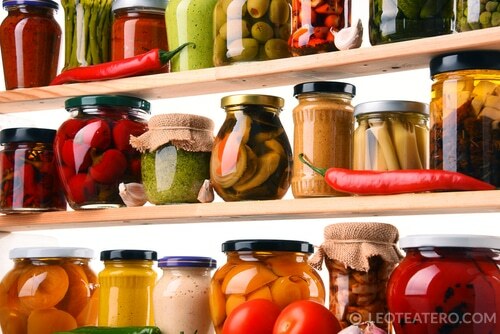 Charcuterie is kept in a garde-manger which means the cool area where these products are stored (pantry). 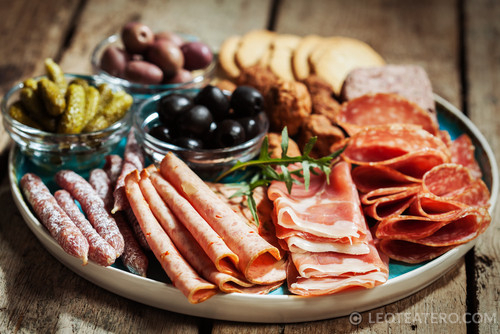 Charcuterie is such an important part of the French cuisine that in formal French kitchens there is a person in charge of managing this area, and named the chef garde-manger. There are few guidelines to help get it right, but ultimately it is for you to decide what makes it onto your charcuterie board. I always aim to have the following seven things on my charcuterie boards, and therefore ready to go in my pantry or refrigerator. Something to drink with it all (my preference is wine, but beer works too). You can try new things, re-vamp and mix different flavours, textures, styles or even regions of France. You can make charcuterie platters more vegetarian friendly for your guests by adding hummus and tzatziki to the mix, it’s all up to you. 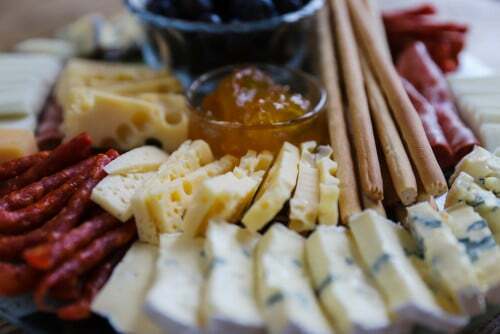 Select a variety of meats and cheeses ranging from mild, medium to bold flavours. It is helpful to have a range of choices, which will be more pleasing to the palate. It is also about creating contrasting or complementary textures. Serving creamy smooth pâté or terrine, alongside crunchy pears and hard cheese. Soft blueberries and cheeses with tart cornichons, grainy mustards, baguette and crispy crackers. The key is a mixture, which will give the board depth. A good piece of pâté will be a sure way to start your board off right. 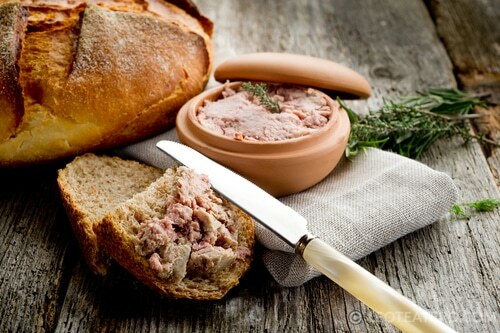 Pâté is usually made from chicken or duck liver and comes in a variety of tastes and textures. 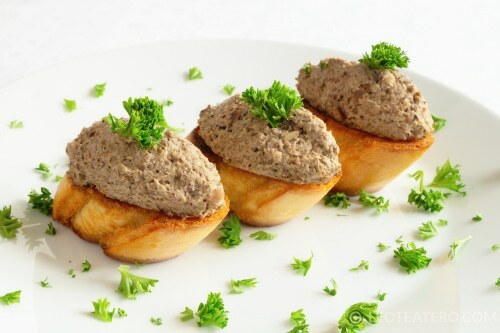 Try pâté de campagne (country pâté) or pâté forestier (forest-inspried pâté, i.e. 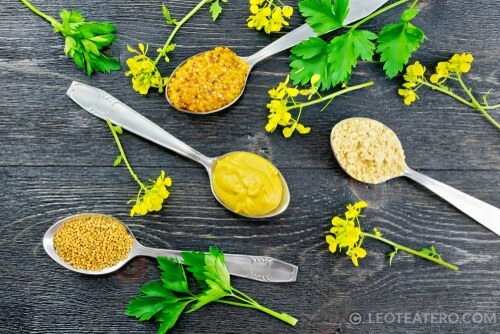 with herbs, mushrooms or nuts). Terrine is another version of pâté, but also comes in vegetable or fish versions. It also refers the moulding dish in which it is prepared. Dried and cooked sausages are also a big must on your boards. 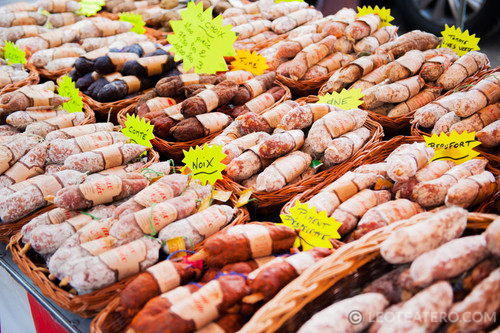 In France, like many of the terroir product sausages, galantines and ballotines are regionally available and have certifications along with them. Andouille de Guémené (the star of Brittany charcuteries) or Saucisson Sec like the Rosette de Lyon are both quite famous and available everywhere in France. These products are the reflection of the terroir (environment contexts, farming practices and local cooking culture). They are intimately linked to their history and culture of every region, with over 450 specialties in the country. For thinly sliced meat Jambon de Bayonne is a huge hit. In Occitanie, Jambon d’Averyon is quite popular too. A very lean one is Viande des Grisons, a Swiss Alps specialty made from beef. Of course, one cannot talk about French ham without talking about truffled cooked ham. Something, I don’t have a taste for, but remains extremely popular, especially during the holiday seasons. You don’t need to be an expert in meats to select meats and pâtés; just ask your local butcher what they have and what it tastes like. Most boucheries or butchers will let you taste each before buying, but don’t do this at the busy times for shopping, especially in France. 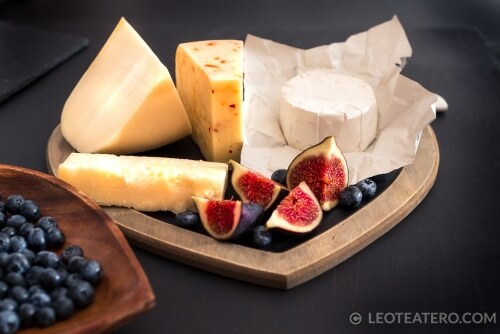 For cheeses, I select mild and sharp flavours and do at least three types, ranging from soft to hard cheeses and place them in separate planches on table, if I am doing several boards. Goat cheese or chevre is a mild cheese and a hit with those who cannot eat lactose so easily, as it comes from goats and not cows. Check out my cheese blog from a few weeks ago. It explains the cheese groups and how to select cheese properly. I always like to add homemade things to my platters. One of my top favourites and a hit with many of my guests is my blueberry and/or apricot jam. Onion jam is often served and very popular. Both flavours pair well with meats and cheeses, especially goats’ cheese. The fruit will add sweetness to the saltiness and balance things out on your palate. If you want to get extra creative, you can roast or grill fresh fruit. 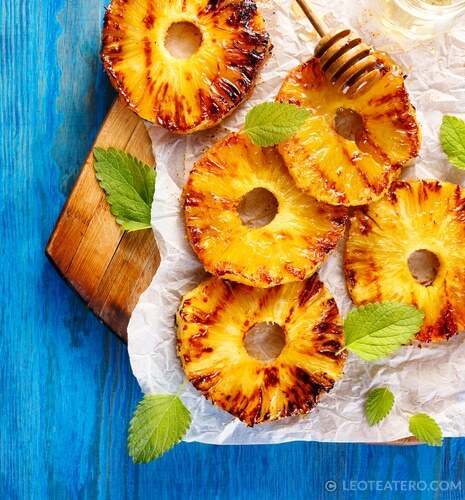 Try grilled pineapple or grilled melon. Rillettes (pronounced ree yet) are meats shredded and cooked in their own fat, then blended with spices, lemon confit and sometimes yogurt and butter. They come in many varieties like pork, duck, salmon or mackerel. 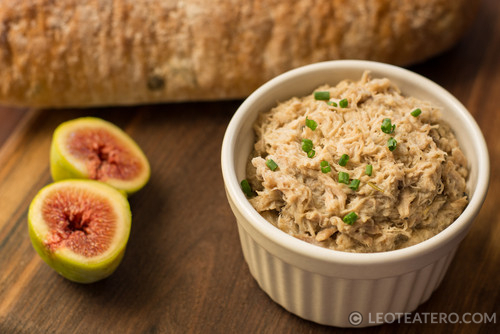 Try my mackerel rillettes recipe. It’s easy to make and popular, but don’t forget the lemons. Rillettes du Mans is a famous French rillettes made from pork. 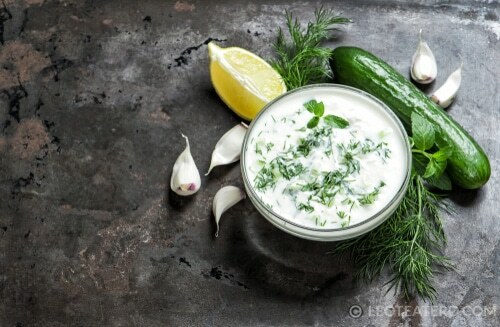 Provide something salty or briny (which means the saltiness of the sea, aka pickled) to the board. 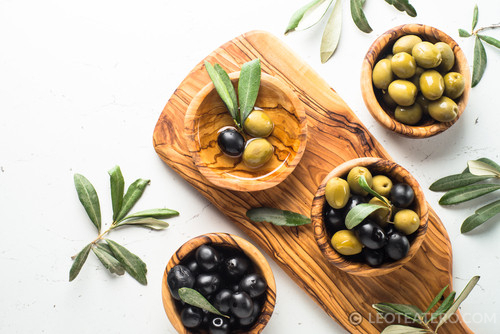 Cornichon (pickles), olives, pickled onions and special vegetable reserves, like little corn cobs or asparagus, are great on charcuterie boards. 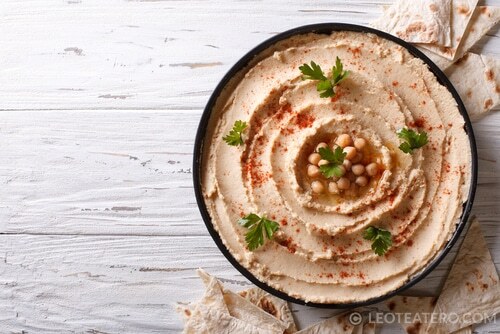 Other items may also include any of your favourite spreads, such as Dijon and/or grainy mustard, olive tapenade and hummus. These spreads are great for smearing on sliced baguette with meat and cheese on top. Something crunchy, like nuts. 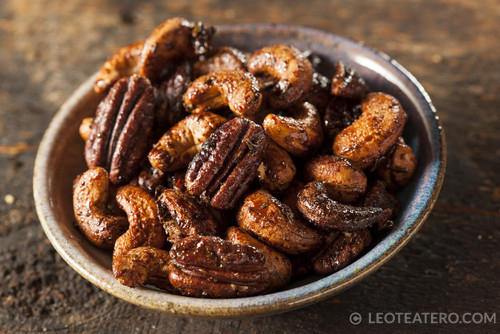 I find that scatterings of various dry roasted salted nuts or candied pecans are a huge hit on charcuterie boards. I also bake thyme-salted cashews and serve those. Who doesn’t like a home roasted nut now and then? Herbs are another small addition to your boards that have a great effect. A little chives or rosemary and a small pot of honey with a spoon, combine this with soft cheese on a piece of bread and you have the ultimate French canapés. 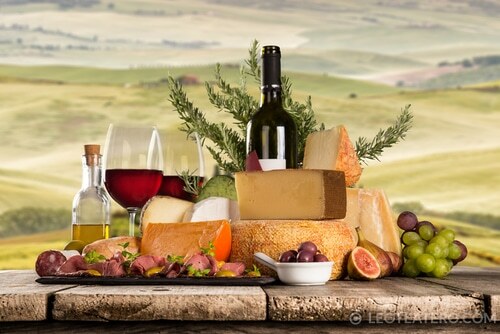 Wine and beer pair excellently with meat and cheese and can enhance the flavour experience. You should pair a bold-flavoured meat and cheese with bold-flavoured alcohol, for best results. The rule is mild with mild and bold with bold. 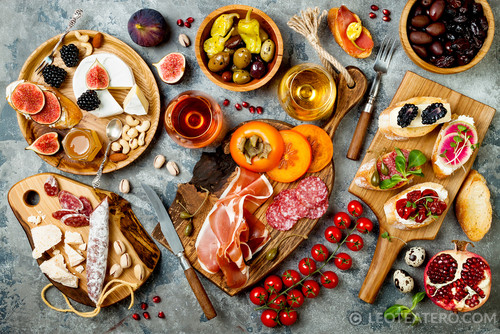 For example, goat cheese, smoked salmon and Bayonne ham pairs well with white wine, while saucisse Lyonnaise, Comté and Roquefort pairs great with red wine. Crackers & bread: In France crackers are rarely served on charcuterie boards, but I grew up with them and so they make it on my boards. I buy flavoured ones with rosemary and herbs or ones with nuts like sesames. Regardless of the cracker, you must serve bread, preferably sliced baguette and a darker rye breads for salmon and fish rillettes. 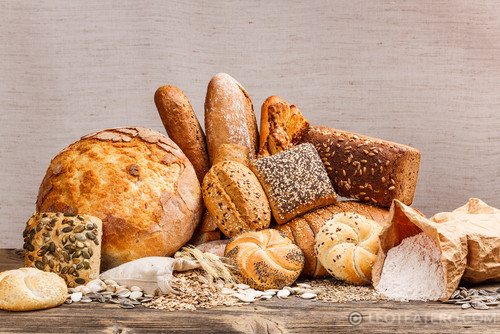 Be creative with the breads and crackers, for example nutty or olive breads, to play with a variety of taste pairings. Like in all things entertaining, be sure to note the seasonal goods available. It not only costs less but also helps one stay in the moment. Put fresh herbs and cherry tomatoes on your planche in the spring. How about adding pears and grapes at the end of the summer. Embrace the fall with blueberries and recently picked cucumbers. Wintertime is the perfect time to try out cheese with pomegranates and rosemary. 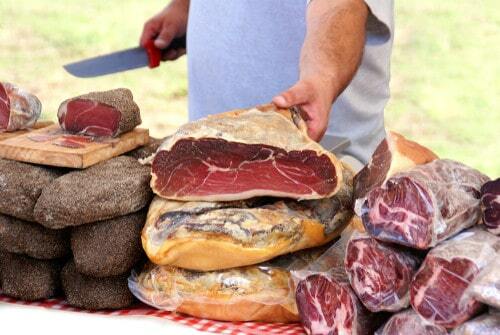 French charcuteries are the expression of a centuries-old art of living, sharing and hospitality. And don’t forget to stock that pantry!